BELIZE CITY, Thurs. May 28, 2015–For a number of years here at Amandala, we’ve been writing about the varying standards employed for the production of the Belize flag, and we have also documented the official version of the Belize flag with photos provided to us by the George Price Center in Belmopan. Whereas the issue of variances of the Belize flag usually comes up during the September celebrations, when they are mass-produced for sale and circulation, it resurfaced this week following the signing in Guatemala City of the protocol to amend the 2008 special agreement between Belize and Guatemala, for the possible adjudication of the territorial differendum at the International Court of Justice (ICJ). The centerpiece of the Belize flag—the historic Coat of Arms—was much smaller than it should appear on the flag, and the Belizean logwood cutters in the center were even more miniscule than they should be. 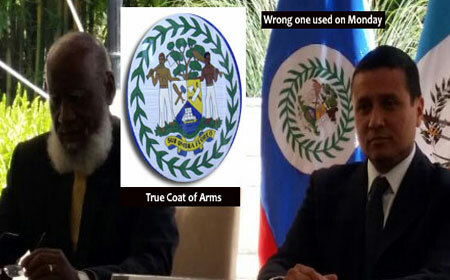 Several members of the public have complained that the flag which was used for the signing ceremony, which took place at the Foreign Affairs Ministry in Guatemala, was “not the Belize flag” – or at least not the correct version of it. Some, furthermore, deem it an insult and say that the Foreign Minister of Belize, Wilfred Elrington, should not have signed the ICJ protocol sitting in front of the flag. We took a good look at the photos documenting the signing, as well as the image provided to us some years ago by the George Price Center, and indeed, it is clear that the flag used at the signing is a far cry from what the official flag should be. Most noteworthy is the misrepresentation of the Belize Coat of Arms – the centerpiece of the Belize flag which uniquely captures Belize’s history during the days of the African logwood cutters. “The Coat of Arms embodies an important aspect of the history of Belize, as the mahogany industry formed the basis of our economy in the 18th and 19th centuries,” the Government of Belize says on its website posting. If you take a look at the version of the flag flown this past Monday in Guatemala, though, you will find that the size of the Belize Coat of Arms is smaller, and the people on the flag appear substantially smaller than normal, while the wreath takes up much more space than it should. In response to the public reaction to the inaccurate flag, we spoke with an official from the Belize Ministry of Foreign Affairs, who told us that someone had raised the issue to them earlier today as well, pointing out that something is wrong with the flag that was used at the signing ceremony in Guatemala City; however, the official deemed it not to be a malicious act on the part of Guatemala. We were told that Foreign Affairs officials pointed out the problem with the flag on Monday, and “if it was seen early enough and it could have been changed” it would have been. We were advised that the Belize Embassy in Guatemala would be asked to make a donation to Guatemala of the right Belize flag, so that the error is not repeated.